Yes, I was waiting for this! PlayStation's co-op sale wasn't really up my alley, so I placed my hopes on a Black Friday sale delivering the goods. 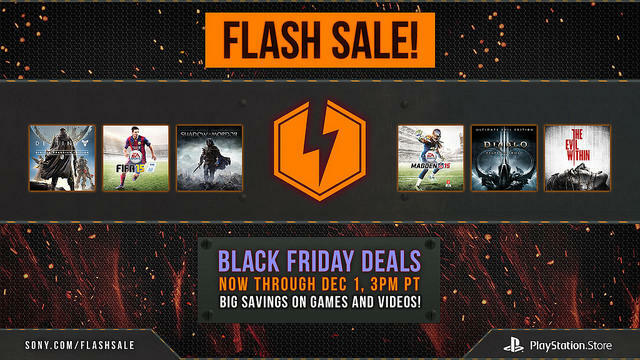 Sony has a new flash sale up and running until Dec 1st with a whole host of PlayStation 3 and 4 games dropped to as much as 65 percent. Meehhhh, nothing really up my alley this year that I don't already own. Probably for the best because I need to save a few bucks. Are you actually even allowed to call $89.99 a "sale price?" Normally when I see these Black Friday sales from PlayStation, I always go for the cheap $2 or $5 classics, but this year's sale is obviously all about the biggest and the newest. The only thing I really want to play is Transistor, but I just don't have the time or the desire this week. Outside of that, the best recommendations I can make are The Evil Within and Middle Earth: Shadow of Mordor. Both are two of my favorite games this year, and the asking prices are more than fair. Also, don't pick up inFamous: Second Son for that price because it will be free through the PlayStation Plus Instant Game Collection in January. That is, unless you want to outright own the game rather than rent it for a year, then I understand. As always, Sony also has a bunch of movies and TV shows available at a cheap price as well. You can see the full list at PlayStation Blog. Let us know below if you see anything you like.